Just finished this build today. 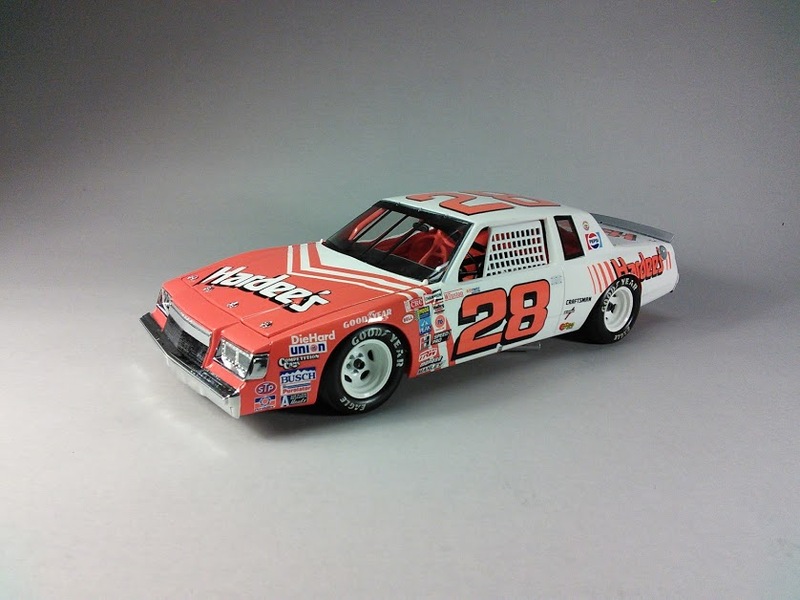 About halfway through the 1981 season Bobby Allison changed his paint scheme and sponsor from the black and silver Tuf-Lon/5 Racers Regal to the new Hardee's orange and white Regal and promptly won the World 600 at Charlotte. Bobby also won the Gabriel 400 at Michigan as well as the Winston Western 500 at Riverside. 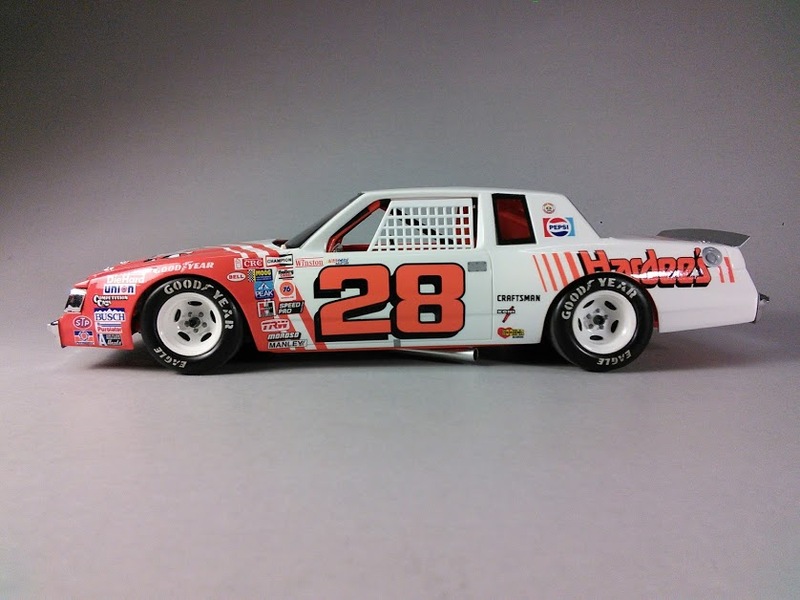 The paint scheme and Hardee's logos changed from time to time during the later half of the season and I always liked the scheme that included the black shadowed numbers and qtr panel Hardee's logo with the stripes. KIT: Monogram. Pretty much right out of the box. PAINT: Tamiya TS-12 Orange and TS-26 Pure White. The TS-12 is pretty close to the decals right out of the can even though the photos make it look a bit different. In person the oranges match is REALLY close. DECALS: Wetworks. Tire decals and gauges are Powerslide. The fire extinguisher is from Slixx. BUILD NOTES: Only mods were using 5/32" KS aluminum tubing for exhaust dumps, heat shrink for roll bar padding, and I added my own opera windows using clear plastic. I also added some Detail Master racing harnesses. Surprisingly, as good as this kit is, it doesn't come with the correct opera windows. Still, this kit is, in my opinion, one of the best ever produced by any kit manufacturer. The fit and stance is almost perfect. Everything almost falls together. 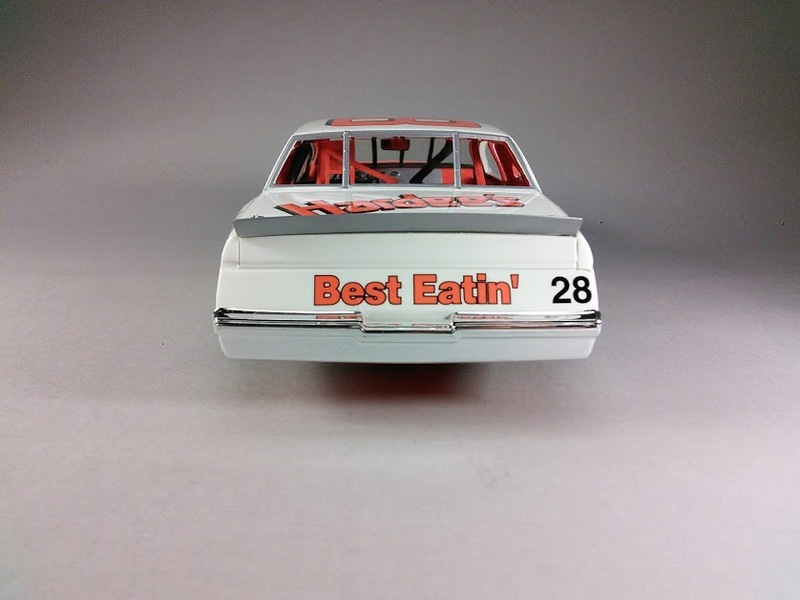 If you've never built one you need to because it's pure nascar model building enjoyment! Wow always liked this car great job. She's a beaut!!! I'd give a monkey if someone would repop that sheet. Great job! Your builds are always so clean. Very nice build. 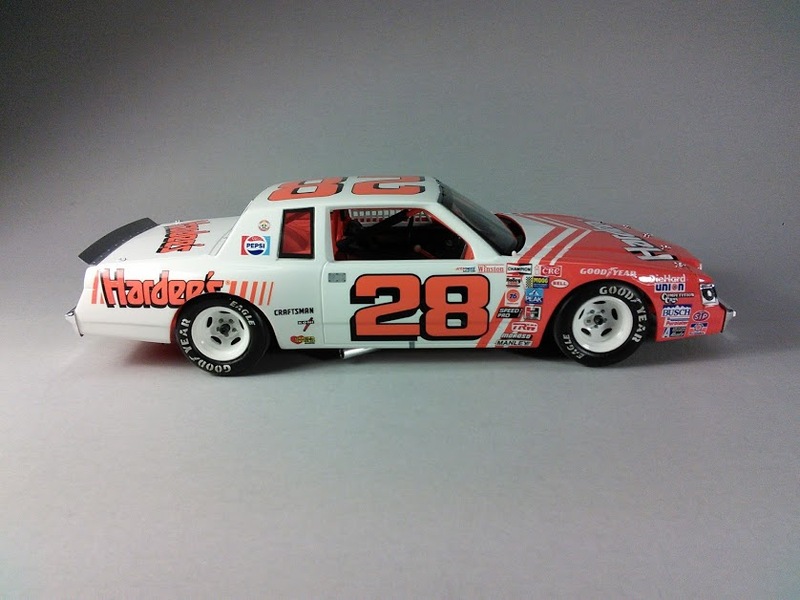 I've always liked that Hardee's paint scheme. Well executed build, as usual. 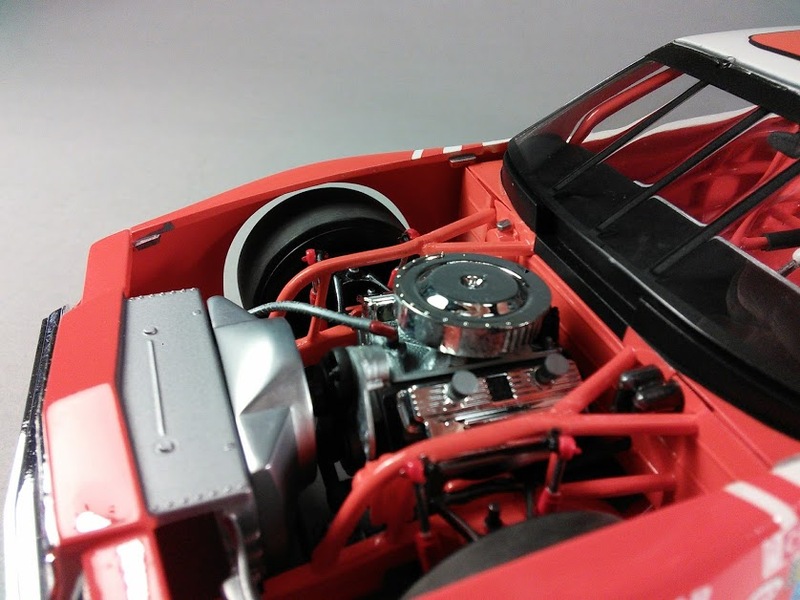 Nice paint & detail work on your model. 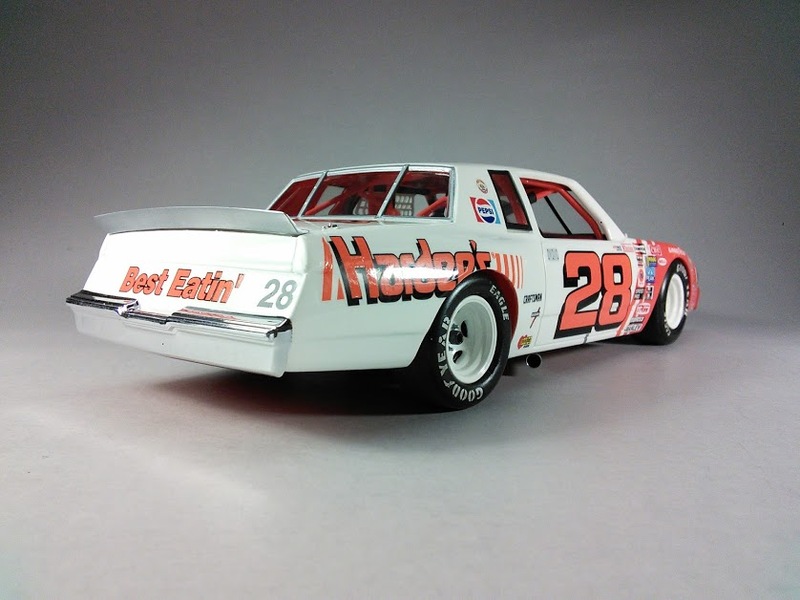 FWIW however, your efforts in making opera window glass is overshadowed by the fact NASCAR outlawed all side window glass after the 4th race in 1981; probably the reason Monogram didn't include any in their early kits. Another one of your beauties!!! Great job Bobby. Really outstanding as usual. Great job!!! Where do you find the decal for the fire extinguisher? Thanks Bill. The fire extinguisher decal is from the Slixx Nitrous & Fire Bottle Goodie Sheet #8008. The silver tie down bands on the fire ext. are cut strips from a chrome decal sheet I picked up years ago. Stunning build as usual. 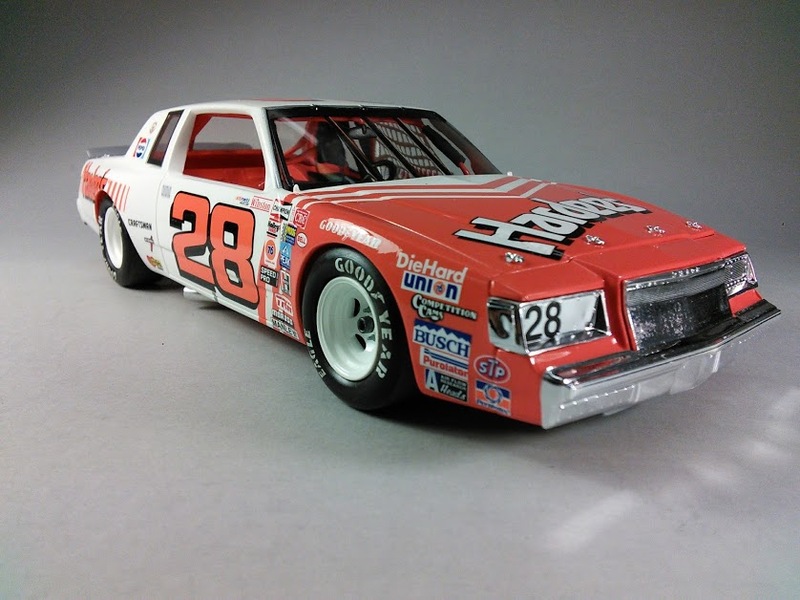 I don't think anybody ever did NASCAR models as well as the first generation of the GM Monogram kits. (The Ford was another story). I think the Buick is my favorite, but the MC and Pontiac were very close. 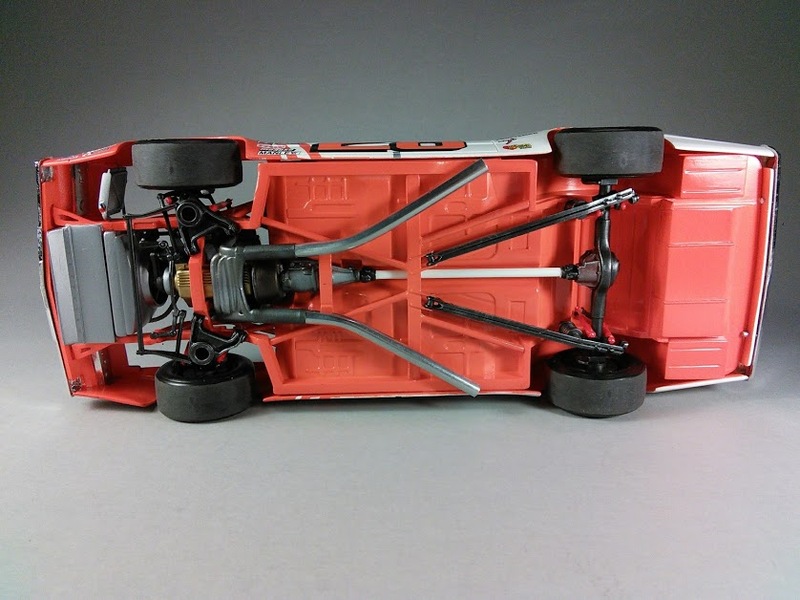 They were an exhaust system and better wheels away from a perfect kit. Yours is one of the finest examples you'll find anywhere. Having seen some of your builds first hand at Huntsville and Murfreesboro, all I can say is, as fine as the photography is, they still have to be seen first hand to be really appreciated.